For a richly flavored butter, give the hazelnuts a longer roast than you might for some recipes. Let the nuts cool thoroughly before using. There's a honey option (see Note below) that's not to be missed by all you honey fans. How to use hazelnut butter? Well, any way you'd use peanut butter is a start. If you're going to pair it with jams, my choice is raspberry, which goes so well with hazelnuts. Hazelnut butter is also delicious smeared on chunks of apple. Hazelnut butter can be stored for weeks at a time in your refrigerator, unless everyone else discovers your secret. Then all bets are off. So you'd better have a back-up jar hidden on another shelf! Place the hazelnuts in the work bowl of a food processor. Using the pulse button, chop them until they resemble coarse meal. Then keep the machine running, stopping every 10 or 15 seconds so the nuts don't get too warm. Keep processing until the nuts go from crumbly and grainy to smooth and creamy. At any point along the way, add the salt and sugar if you are using it. It's not necessary; I just find the flavor deeper and more, well, flavorful! The creamy texture is an amazing thing to watch, and occurs only after the nuts release their oils into the purée. Once the mixture turns soft and creamy, you can throw in the additional ½ cup of roasted nuts and process briefly to make a "chunky" hazelnut butter. Hazelnut butter will keep for several weeks at room temperature without developing off-flavors, but for longer periods, keep it refrigerated. 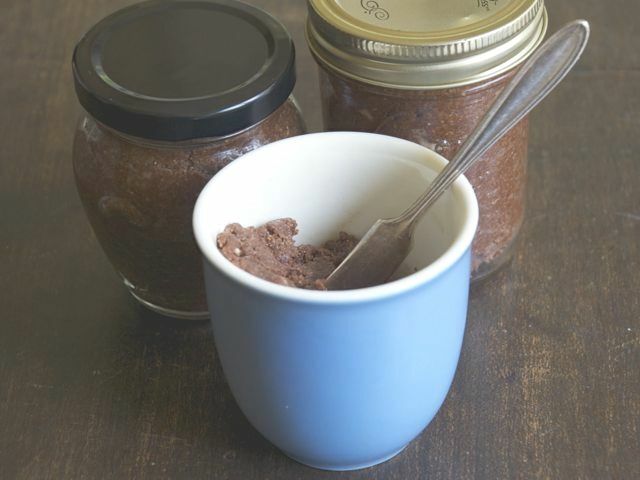 Hazelnut-Cocoa Butter: Stir ¼ cup of good-quality cocoa powder into the 2 cups of hazelnut butter. If you didn't add the ¼ cup of granulated sugar, then you will need to stir that in also. Honey-Hazelnut Butter: Honey is an amazingly complimentary flavor to hazelnut butter. Instead of the ¼ cup of granulated sugar, blend in 2 to 3 tablespoons of honey; omit cocoa powder. Delicious!